Super Mario Odyssey – the franchise’s return to open sandbox levels – has received a perfect 10/10 review score from Edge Magazine, as reported by Nintendo Everything. 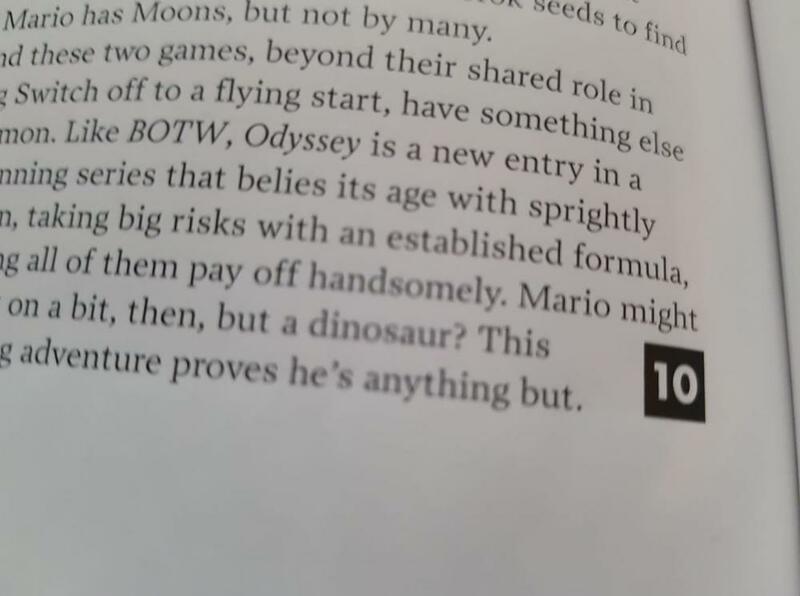 EDGE delayed this month’s issue of the magazine “to accommodate an exclusive embargo.” That exclusive turned out to be Super Mario Odyssey. According to metacritic, the magazine has given previous 10/10 scores to: The Last of Us, Grand Theft Auto V, Grand Theft Auto IV, Rock Band 3, Bayonetta 2, The Orange Box, Bayonetta, Little Big Planet, Half-Life 2, Breath of the Wild, Skyward Sword, Halo 3, Super Mario Galaxy, Bloodborne, and Super Mario Galaxy 2. The usual suspects are here but perfect scores for Skyward Sword, Rock Band 3 and Halo 3 suggest to me scores fueled by hype and anticipation. All three were also reviewed in the 90% range by many top critics as well so no matter what I think, the industry tended to agree at the time. What makes a 10/10 is an interesting topic. No game can be perfect, but I’d think a 10 suggests a game that transcends its competition to become an essential play. Or is simply an intensely enjoyable experience that isn’t hampered by its flaws. I gave BotW a 5/5 because of the experience and sense of wonder it produced. The flaws were negligible in my eyes, and I found the game to be absolutely essential for any Wii U / Switch owner to experience. I also prefer grading on a 5 point scale as I feel the numbers are far less important than the words. An 8/10 game could be solidly entertaining for some, an all-time favorite for others, or a horrible trudge. I’m not just talking about genre preference either. Final Fantasy XIII I would give a 7/10 or 3/5. Its first half is atrociously paced and the storyline is over-written nonsense. BUT, players that can handle high-concept anime plots, love the battle systems and live for grinding post-game LOVE it. A simple number out of ten could never convey the swinging extremes of passion for the game. I would give Mario 3, World, and 64 perfect scores as well. Galaxy 1 was a 4/5 for me as I had huge issue with the motion controls and frustrating lack of momentum, as the game constantly slows Mario down. For others Galaxy is their high-water mark for the series. This is why reading a review is infinitely more important than a score. However, I’m reporting on the score because Mario Odyssey is an important game for an important year of an important console. This score could influence buyers and other reviewers, therefore, a simple review number is news.